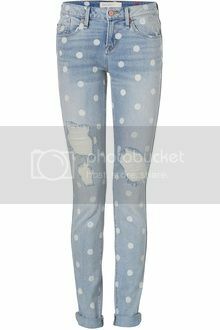 On my wishlist this dots jeans from Marc by Marc Jacob spring collection. They are sold out everywhere...I can't understand why I am always want to buy something when it's sold out. Crazy! Anyway a funny pair of dots jeans makes your look casual, chic and super cute! Wearing with a white v-neck tee and a pair of gladiator sandals. Zara also makes a great budget one. If you love DIY check out this talented girl, Aimee of Swell Mayde and her DIY | Marc jacob inspired polka dots jeans.